… since 1980 Republicans have never won the popular vote in a presidential election without winning a majority of the Catholic vote. 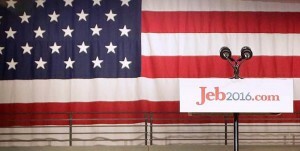 Jeb Bush’s presidential aspirations are over even as he’s officially launching them. It doesn’t matter how much money he raises. It doesn’t matter how much the liberal media tries to brainwash us about how he’s the only “electable” candidate we have. It doesn’t matter how many people he has shilling for him on Fox News. And it doesn’t even matter how unlikeable Hillary Clinton is or how little the public trusts her. We can look at 1980 as the watershed year for such analysis because that was the moment of the last major political realignment in America – the Reagan Revolution. It produced two tectonic shifts: The Christian Right was born and the former solidly Democrat south began moving into the Republican column. The Christian Right, the formidable alliance of traditional Catholics and evangelicals forged by the likes of Paul Weyrich and Jerry Falwell (among others), gave Reagan a third leg to his stool that his upstart predecessor Barry Goldwater couldn’t have dreamed of in 1964. Prior to 1980, Catholics had only voted majority Republican once in the previous seven presidential elections and evangelicals weren’t even considered a viable demographic until then. In fact, the first real attempt to mobilize evangelicals politically post-World War II was done in 1976 when Democrat Jimmy Carter openly advertised himself as a born-again Christian. But then Roe v. Wade changed everything. The Catholics were first to the front lines of the pro-life cause and evangelicals soon followed. Their shared courage of conviction on this issue produced the common ground for the coalition, which gave Reagan the nationwide grassroots army Goldwater never had. With the birth of the Christian Right, a majority of Catholics voted Republican in a presidential election three times in a row for the first time ever between 1980-1988. Not coincidentally, Republicans won all three elections. So, what’s the problem here? Isn’t Jeb a convert to Catholicism? Yes, but it’s not as simple as identity politics. See, Catholics don’t vote majority Republican as an isolated group or based on identity alone. As a voting bloc, they tend to be more in favor of bigger government than evangelicals, so what causes them to cross over are those pesky social issues that establishment candidates like Jeb Bush are eager to run away from.